If you have a desire to see Mount Everest and visit base camp, or not, and don't want the hardships that go along with such an achievement. We have the trip for you! Shorter duration, 8- days instead of 15, private bathrooms, great foot, comfortable beds with linens all while in the eyes of Everest. You will visit the Sir Edmund Hillary School and home of the infamous climbing Sherpas. While at Thyangboche you may even have the chance to sit in on an afternoon chant with the monks. Day 9: Fly Lukla to Kathmandu - Yak and Yeti hotel. The flight from Kathmandu to Lukla is an adrenaline rush in itself. As the plane banks right and enters the Khumbu region you are rewarded with a fantastic view of the Himalayan giants and the landing experience at the sloping tarmac at Lukla adds to excitement. The airhead at Lukla serves as the gateway to this region. Here you will meet the Sherpa crew. After spending some time organizing our packs and loads, we are embark on our adventure. It is an easy gradual 3 hours descent to Phakding where we will stop for lunch. After lunch, we continue in an easy pace through cluster of stone houses, past caravans of Dzos until we reach the sleepy settlement of Monjo. The trail climbs quite dramatically today. As the path snakes upwards the vistas open up revealing the imposing Himalayan giants. The next village Jorsale is the gateway to Sagarmatha National Park where the entrance ticket to the park is checked. The trail follows the river until the last suspension bridge over the Dudh Kosi River is reached, where the trail cross the river at a dizzying height. From here the trails winds uphill all the way to Namche Bazaar against the backdrop of the beautiful Kwangde, Kusum Kangru, Mt. Everest, Nuptse, Lhotse, Tawache and a host of lesser known peaks. Namche Bazaar situated on a horse shoe amphitheatre is the capital of Sherpa country. You can spend the afternoon exploring the stone paved alleys or rummage through the cyber cafes, souvenir and rental shops that line the streets. This is typically the hardest day on the trek. You can spend the day either in rest at Namche enjoying the incredible scenery and getting used to the altitude. Or if you are the adventurous type you could explore the surrounding area. After breakfast, you may take a side trip onto a ridge and to the Everest View Hotel offering some of the best views of the high Himalayas including Mount Everest, Lhotse, Lhotse Shar, Ama Dablam, and Thamserku. Or you could visit the Thame Monastery, and then trek to the serene Sherpa villages of Khunde 3890 m and Khumjung 3790 m where Sir Edmund Hillary established his first school and hospital. From Namche the walk to Thame is an easy walk of about five hours. The trail follows an almost steady level until you reach the settlement of Thamo, a cluster of houses on the main trail. From here the trail makes a short ascent to Mende. Return through same path near Namche. The short cut trail to Khumjung climbs through forests to Khumjung. After about one and half hour's climb, you will reach at Shyangboche (3700m), a small settlement with a airstrip. Syangboche airstrip is the highest airstrip in Nepal. Again the trail ascends passing the yak farm a Buddhist stupa. Excellent views of the Everest, Lhotse and Amadablam can be seen from here. Then a short descent will take you to the village of Khumjung, the biggest Sherpa settlement of the region. Then a short descent passing a pleasant village of Sanasa will take you to Tashinga. The trail descends through rhododendron forest to the Dudh Koshi. Crossing a suspension bridge, there is about 2 ½ hrs climb through forest to Tengboche. 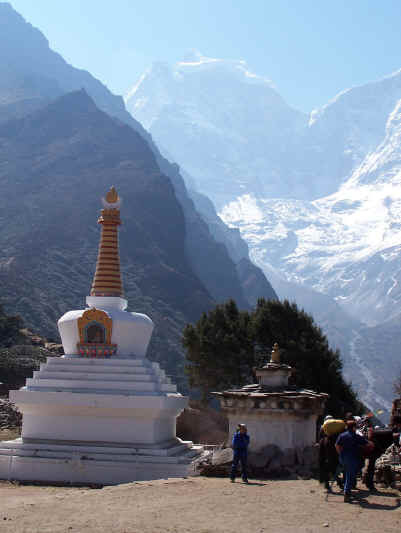 Known as great high place, Tengboche is the most sacred place for whole Khumbu region. Every morning and evening, the monks do chanting in the monastry. Return through same trail to Tashinga. From Tashinga, there is a short climb, then level path with several switchbacks. From Namche, we descend to Monjo through same trail that we climb to Namche. Today you will trek back to Lukla. You will pass through the village of Phakding and have a chance to view the monastery at Gumila above Phakding. Within the monastery reside 12-15 monks from the Gelukpa Sect of Tibetan Buddhism. It takes about 30-45 minutes to reach the monastery from the main trekking route. From here you will retrace your steps back to Lukla. Overnight at lodge/Lukla. Today, you have to take your breakfast early in the morning, have a short walk onto the Lukla airstrip and fly back to Kathmandu. After arriving in Kathmandu, you will transfer to the hotel and overnight in the hotel. Or, private guide for 3 or less. 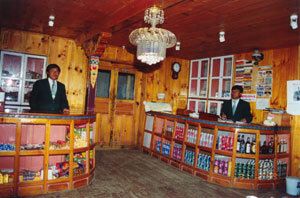 Kathmandu Hotels- We recommend the lovely 5-star Yak and Yeti. Rates from $160US to $300US. Take in a Shiatsu or Swedish massage after your trek, or rest in the quiet garden area around the pool. To customize your ultimate Himalayan experience contact Becky at: trek@peakfreaks.com - Tim Ripple for the benefit of finding a common spelling mistake used when searching Everest on search engines.